When Heather Richardson moved with her two children from Bangor to Aroostook County, where she had grown up, she focused on finding a school that would support them through challenges brought up by their learning disabilities. PRESQUE ISLE, Maine — When Heather Richardson moved with her two children from Bangor to Aroostook County, where she had grown up, she focused on finding a school that would support them through challenges brought up by their learning disabilities. Three years later, with both children thriving in school, Richardson decided that it was time to invest in herself. Within just a few months of making that decision, Richardson has had several job interviews with manufacturing, construction and forest product companies in Aroostook County. She has many more interviews lined up and looks forward to starting a rewarding career that provides greater financial stability for her family. 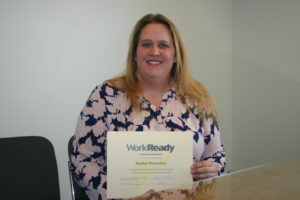 This past spring Richardson became one of seven women to enroll in Aroostook County Action Program’s no-cost WorkReady credential program, a 60-hour course funded by a federal grant from the U.S. Department of Labor aimed at training women for non-traditional, high-paying careers in Aroostook, Washington and Hancock counties. ACAP was one of only four programs in the nation to receive the Women in Apprenticeship and Non-Traditional Occupations grant. With WorkReady, students earn a national credential through Presque Isle’s Adult and Community Education program that employers both locally and across the state such as Acme Monaco, Huber Engineering and L.L. Bean recognize. The course included OSHA 10 certification, that taught students about health and safety hazards in the workplace. During the course, students met with various representatives and female employees from construction, manufacturing and wood forest companies and took tours of Irving Woodlands, LLC in Ashland and Acme Monaco in Presque Isle. They heard stories of women who began their careers in lower-level positions from the production lines to human resources and have since advanced to higher-paying positions within their chosen profession. Richardson, who worked for 11 years as an optician in Bangor, has gained much insight from potential employers, her fellow WorkReady students and through her mentorship with Benson. Since graduating from WorkReady, her goals include settling into a career with a hands-on work environment and gaining more financial stability to purchase a house for her family. After graduating from the WorkReady course, all seven women are either participating in an apprenticeship with their chosen company or going through the job application and interviewing process. During their first year of employment or apprenticeship, Benson will continue to mentor the women and provide guidance. Benson noted that women in non-traditional careers are often paid more per hour than traditional careers, thus narrowing the gender pay gap in those industries. She wants to encourage more women to consider careers that they might not have thought of before. More women in trade and technical fields, she said, also can have many positive effects on Aroostook County’s workforce and economy. While venturing into her new career, Richardson is confident that employers will value her contributions and view her as an equal member of their team. 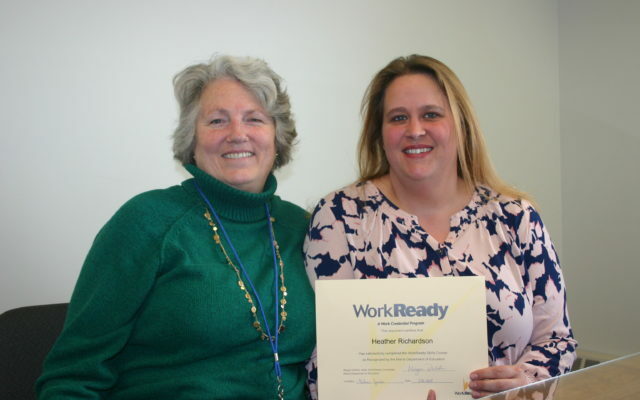 Plans are underway for a WorkReady course to begin in Houlton in May, another to start on June 25 in the St. John Valley, and one in Caribou in July. A second cohort is planned for Presque Isle in August. For more information on the future courses, contact Benson at (207) 554-4165 or ebenson@acap-me.org.